Each camera works a little bit different regarding the use of the Promote Control System for automatic tasks. 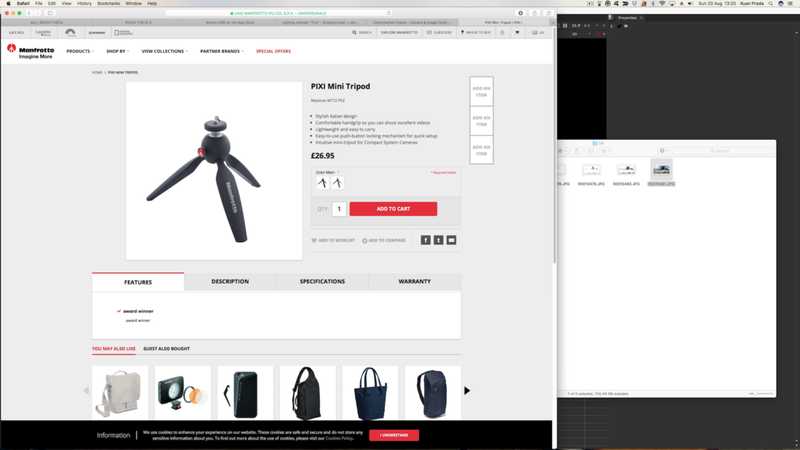 In this particular case I'm going to show you how to configure both, Canon EOS 5D Mark III and Promote Control for it's use on VFX look-dev and lighting image acquisition. Connect both cable to the camera and to the Promote Control. Turn on the Promote Control and press simultaneously right and left buttons to go to the menu. In the setup menu 2 "Use a separate cable for shutter release" select yes. In the setup menu 9 "Enable exposures below 1/4000" select yes. This is very important if you need more than 5 brackets for your HDRIs. Press the central button to exit the menu. Turn on your Canon EOS 5D Mark III and go to the menu. Mirror lock-up should be off. Long exposure noise reduction should be off as well. We don't want to vary noise level between brackets. Find your neutral exposure and pass the information on to the Promote Control. Select the desired number of brackets and you are ready to go. Not too long ago, we needed to create a lightrig to lit a very reflective character, something like a robot made of chrome. This robot is placed in a real environment with a lot of practical lights, and this lights are changing all the time. The robot will be created in 3D and we need to integrate it in the real environment, and as I said, all the lights will be changing intensity and temperature, some of then flickering all the time and very quickly. And we are talking about a long sequence without cuts, that means we can’t cheat as much as we’d like. 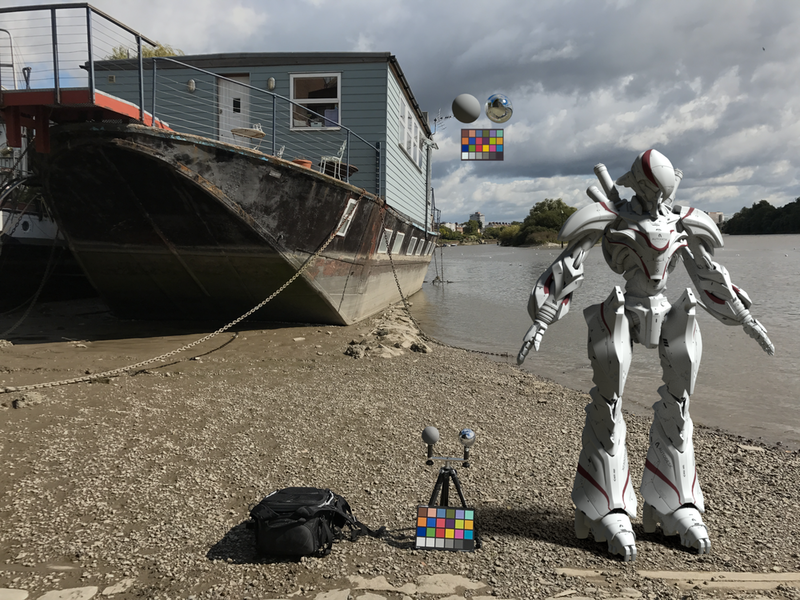 In this situation we can’t use standard equirectangular HDRIs. They won’t be good enough to lit the character as the lighting changes will not be covered by a single panoramic image. The best solution for this case is probably the Spheron. If you can afford it or rent it on time, this is your tool. You can get awesome HDRI animations to solve this problem. But we couldn’t get it on time, so this is not an option for us. Then we thought about shooting HDRI as usual, one equirectangular panorama for each lighting condition. It worked for some shots but in others when the lights are changing very fast and blinking, we needed to capture live action videos. 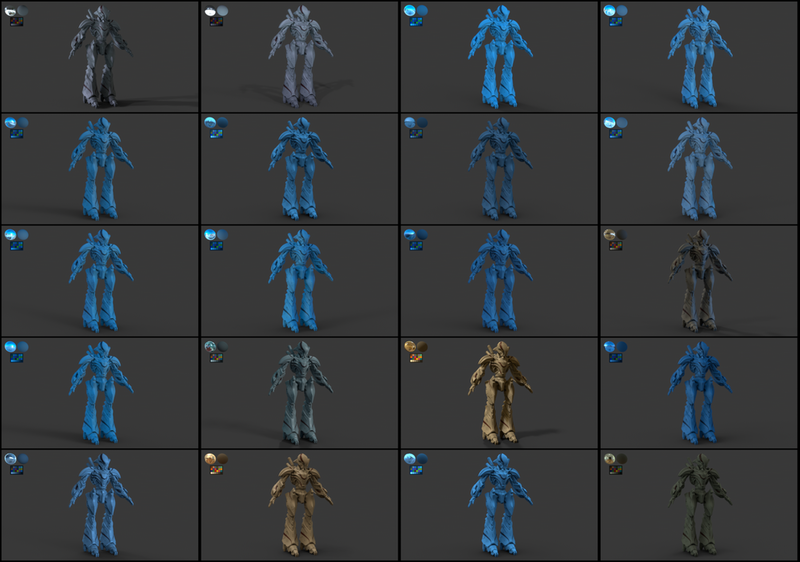 Tricks animating the transition between different HDRIs wouldn’t be good enough. So the next step it would be to capture HDRI videos with different exposures to create our equirectangular maps. The fastes solution would be to use our regular rigs (Canon 5D Mark III and Nikon D800) mounted in a custom base to support 3 cameras with 3 fisheye lenses. They will have to be overlapped by around 33%. With this rig we should be able to capture the whole environment while recording with a steady cam, just walking around the set. But obviously those cameras can’t record true HDR. They always record h264 or another compression video. And of course we can’t bracket videos with those cameras. To solve the .RAW video and the multi brackting we end up using Red Epic cameras. But using 3 cameras plus 3 lenses is quite expensive for on set survey work, and also quite heavy rig to walk all around a big set. Finally we used only one Red Epic with a 18mm lens mounted in an steady cam, and in the other side of the arm we placed a big akromatic chrome ball. With this ball we can get around 200-240 degrees, even more than using a fisheye lens. Obviously we will get some distorsion on the sides of the panorama, but honestly, have you ever seen a perfect equirectangular panorama for 3D lighting being used in a post house? With the Epic we shot .RAW video a 5 brackets, rocedording the akromatic ball all the time and just walking around the set. The final resolution was 4k. We imported the footage in Nuke and convert it using a simple spherical transform node to create true HDR equirectangular panoramas. Finally we combined all the exposures. With this simple setup we worked really fast and efficient. 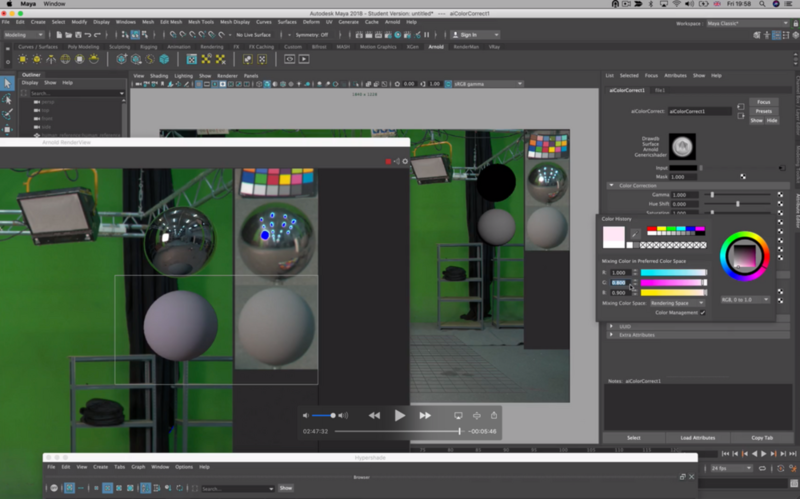 Precision was accurate in reflections and lighting and the render time was ridiculous. Can’t show any of this footage now but I’ll do it soon. We had a few days to make tests while the set was being built. Some parts of the set were quite inaccessible for a tall person like me. In the early days of set constructing we didn’t have the full rig with us but we wanted to make quick test, capture footage and send it back to the studio, so lighting artists could make some Nuke templates to process all the information later on while shooting with the Epic. We did a few tests with the GoPro hero 3 Black Edition. This little camera is great, light and versatile. 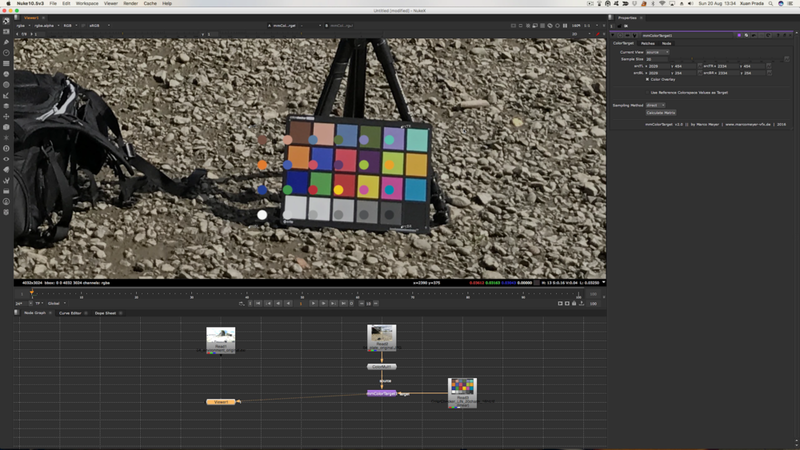 Of course we can’t shot .RAW but at least it has a flat colour profile and can shot 4k resolution. You can also control the white balance and the exposure. Good enough for our tests. We used an akromatic chrome ball mounted on an akromatic base, and on the other side we mounted the GoPro using a Joby support. We shot using the same methodology that we developed for the Epic. Everything worked like a charm getting nice panormas for previs and testing purposes. It also was fun to shot with quite unusual rig, and it helped us to get used to the set and to create all the Nuke templates. 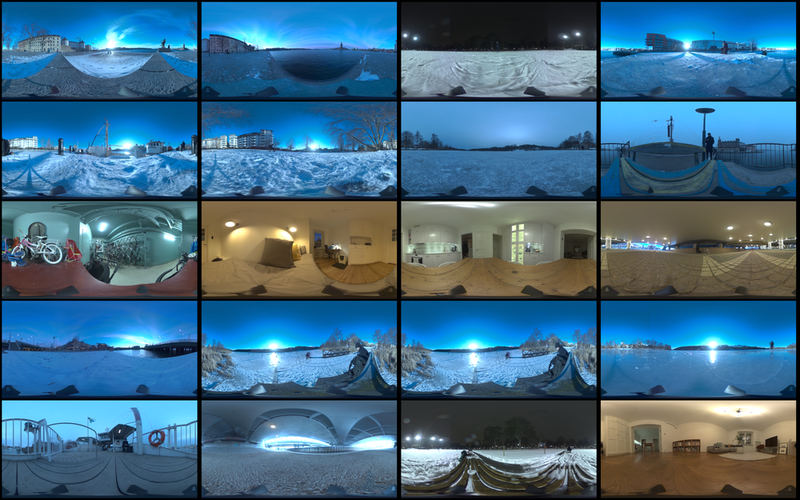 We also did some render tests with the final panoramas and the results were not bad at all. 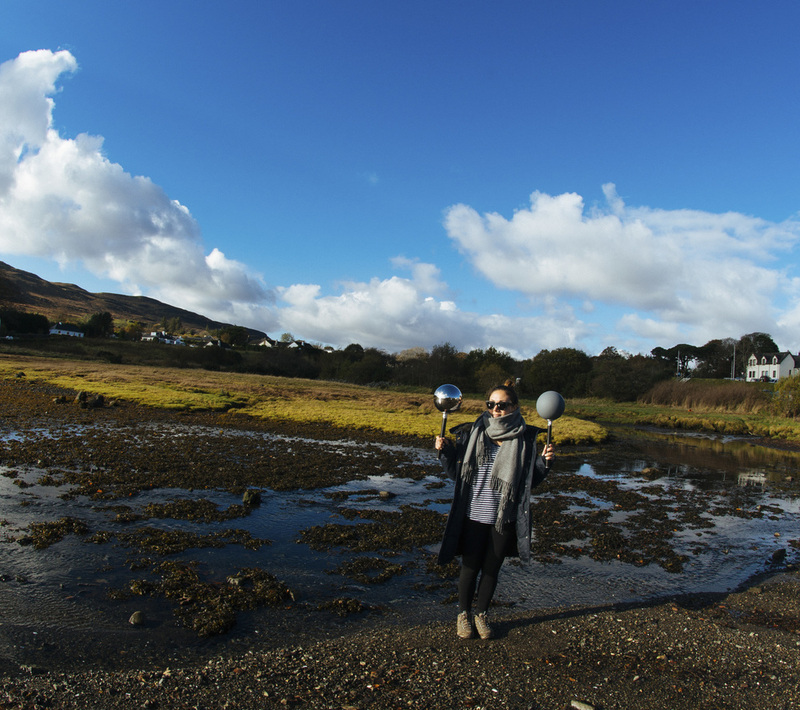 Obviously these panoramas are not true HDR but for some indie projects or low budget projects this would be an option. In this case I’m in the center of the ball and this issue doesn’t help to get the best image. The key here is to use a steady cam to reduce this problem. Nuke work is very simple here, just use a spherical transform node to convert the footage to equirectangular panoramas. Check the new panorama that I shot for akromatic, this week is completely free!! Sometimes you may need to fix the nadir of the HDRI panoramas used for lighting and look-development. It’s very common that your tripod is placed on the ground of your pictures, specially if you use a Nodal Ninja panoramic head or similar. You know, one of those pano heads that you need to shoot images for zenit and nadir. I usually do this task in another specific tools for VFX panoramas like PtGui, but if you dont’ have PtGui the easiest way to handle this is in Nuke. It is also very common when you work on a big VFX facility, that other people work on the stitching process of the HDRI panoramas. If they are in a hurry they might stitch the panorama and deliver it for lighting forgetting to fix small (or big) imperfections. In that case, I’m pretty sure that you as lighting or look-dev artist will not have PtGui installed on your machine, so Nuke will be your best friend to fix those imperfections. This is an example that I took while ago.One of the brackets for one of the angles. As you can see I’m shooting remote with my laptop but it’s covering a big chunk of the ground. When the panorama was stitched, the laptop became a problem. This panorama is just a preview, sorry for the low image quality. Fixing this in an aquirectangular panorama would be a bit tricky, even worse if you are using a Nodal Ninja type pano head. 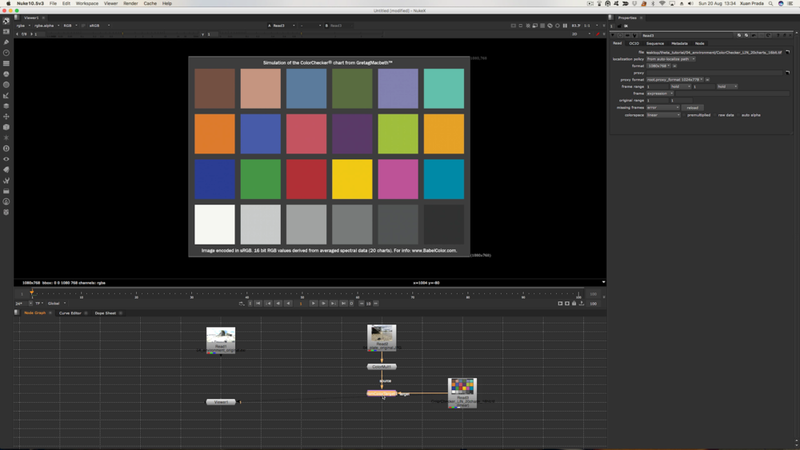 First of all, import your equirectangular panorama in Nuke and use your desired colour space. 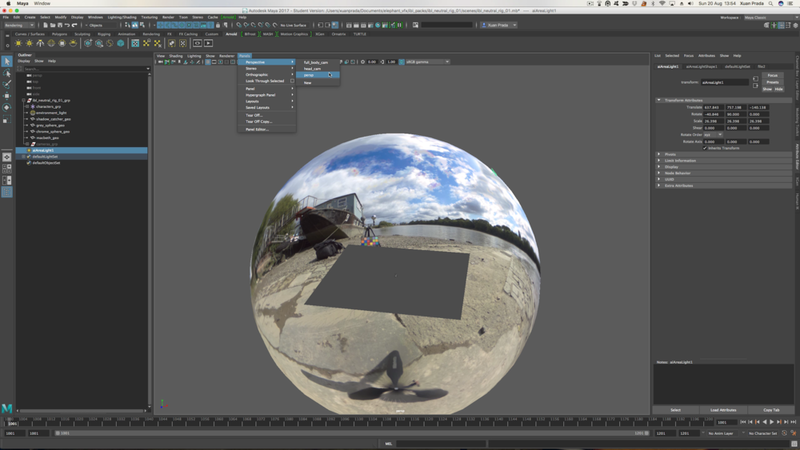 Use a spherical transform node to see the panorama as a mirror ball. Change the input type to “Lat Long map” and the output type to “Mirror Ball“. In this image you can see how your panorama will look in the 3D software. 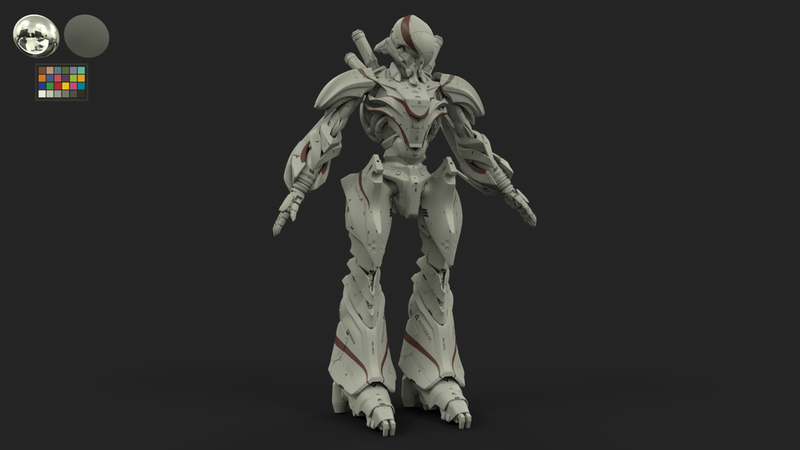 If you think that something is not looking good in the “nadir” just get rid of it before rendering. Use another spherical transform node but in this case change the output type to “Cube” and change the rx to -90 so we can see the bottom side of the cube. Using a roto paint node we can fix whatever you need/want to fix. Take another spherical transform node, change the input type to “Cube” and the output type to “Lat Long map“. You will notice 5 different inputs now. 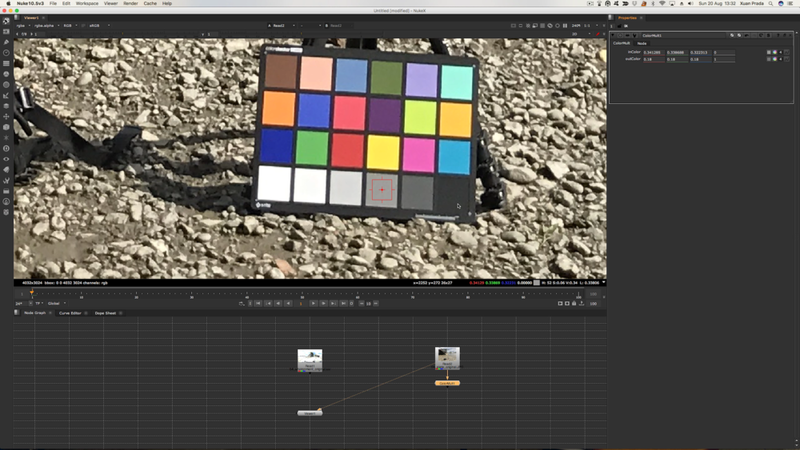 I’m using constant colours to see which input corresponds to each specific part of the panorama. 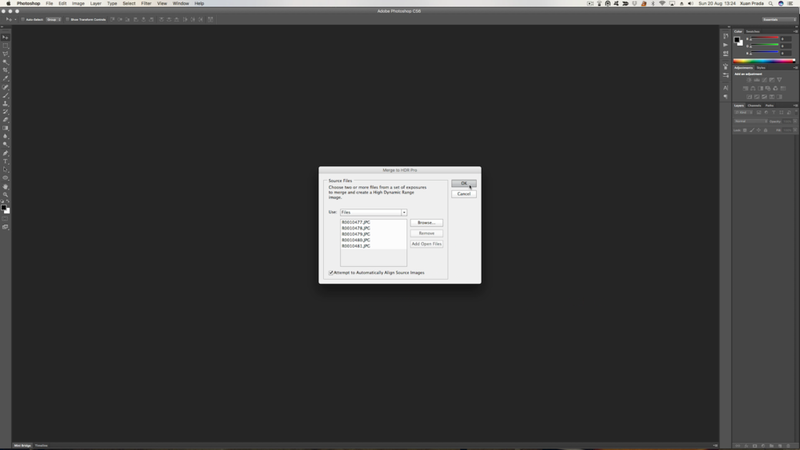 The output format for this node should be the resolution of the final panorama. I replace each constant colour by black colours. Each black colour should have also alpha channel. This is what you get. The nadir that you fixed as a flat image is now projected all the way along on the final panorama. Check the alpha channel of the result. 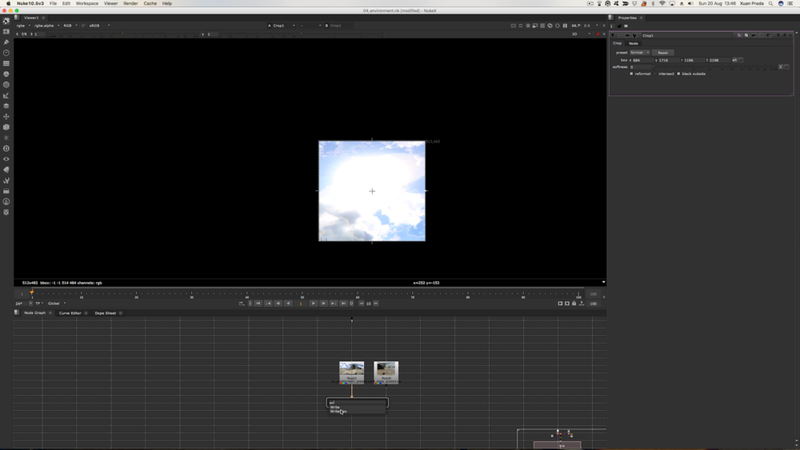 Use a merge node to blend the original panorama with the new nadir. That’s it, use another spherical transform node with the output type set to Mirror Ball to see how the panorama looks like now. As you can see we got rid of the distortions on the ground.